Nothing will ever erase Virginia’s history as the first men’s No. 1 seed to lose its NCAA Tournament opener. At least now the Cavaliers’ wait for the chance to make up for that unprecedented loss is nearly over. The Cavaliers are the second overall No. 1 seed and back in the South Region bracket after losing to the University of Maryland-Baltimore County — better known as UMBC — a year ago. Virginia lost 74-54 to UMBC , becoming the first men’s No. 1 seed ever to lose to a 16 seed. Virginia (29-3) will play an NCAA Tournament newcomer in Gardner-Webb(23-11) of the Big South Conference on Friday in Columbia, South Carolina. Coach Tony Bennett said his Cavaliers know what they have to do to be successful. This is the seventh time Virginia has been a No. 1 seed and the fourth time in six seasons, though the Cavaliers still are looking to reach their first Final Four with Bennett and first since 1984. Second-ranked Virginia had been in the running to be the top overall seed after winning a share of the Atlantic Coast Conference regular-season title only to lose 69-59 to No. 12 Florida State in the ACC tournament semifinals. The Cavaliers’ only other losses this season were to Duke, the overall No. 1 seed. 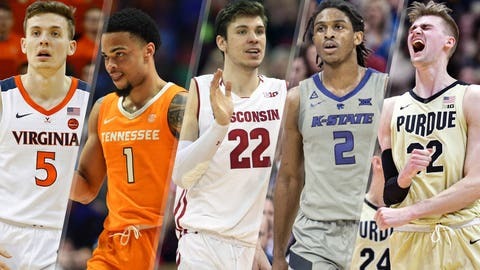 They go into this tournament ranked first in the KenPom.com overall ratings, second in adjusted offensive efficiency (points per 100 possessions) and fifth in adjusted defensive efficiency. Reaching the Final Four in Minneapolis won’t be easy. The Cavaliers find themselves in a bracket with Tennessee, which was the nation’s top-ranked team for nearly a month with the Vols hoping for a No. 1 seed until being routed in the Southeastern Conference tournament final Sunday. The No. 2 seed Vols open Friday in Columbus, Ohio, against Colgate (24-10). The Wisconsin Badgers, who reached the Final Four in 2014 and 2015, are a possible regional semifinal opponent in Louisville, Kentucky, on March 28. There’s also Villanova and Cincinnati, which just beat No. 11 Houston for the American Athletic Conference tournament title just before the brackets were released. SHADOW OF SISTER JEAN: The Tennessee Volunteers (29-5) can sympathize with Virginia’s pain over an early NCAA Tournament loss. The Vols earned their first berth since 2014 only to lose in the second round last year, 63-62 to Loyola-Chicago with famous fan Sister Jean watching. The Vols’ only losses this season have been to ranked opponents: Kansas, Kentucky, LSU and Auburn (twice). Now they play Colgate, the Patriot League tournament champ. The Raiders are 2-0 all-time against Tennessee and are making their first trip since 1996, when they had Adonal Foyle. DEFENDING CHAMPS: Villanova (25-9) will try to defend its title — and win its third championship in four years — as the sixth seed playing No. 11 seed Saint Mary’s (22-11) on Thursday in Hartford, Connecticut. The Big East champs haven’t been seeded this low since 2013. Their opener will be a rematch of 2010 when Saint Mary’s upset the then-No. 2 seed Wildcats. INJURY WATCH: Kansas State (25-8) is hoping to have senior forward Dean Wade back for the fourth-seeded Wildcats’ opener Friday in San Jose against UC Irvine (30-5). Wade missed both games at the Big 12 Tournament, and he was still wearing a walking boot on his right foot Sunday when the bracket was announced. Wade is their second-leading scorer, averaging 12.9 points a game. HOME SWEET HOME: Cincinnati might not be happy being seeded seventh. But the Bearcats (28-6) only have to travel about 100 miles to Columbus to play No. 10 seed Iowa (22-11) with a possible second-round game against Tennessee. THE REST OF THE BRACKET: Third-seeded Purdue (23-9) plays No. 14 seed Old Dominion (26-8) in Hartford on Thursday, and No. 8 seed Ole Miss (20-12) meets nine-seed Oklahoma (19-13) on Friday in Columbia. No. 5 seed Wisconsin (23-10) meets 12th-seeded Oregon (23-12) on Friday in San Jose, with the Ducks having just won four games in as many days for the Pac-12 tournament title. PATH TO MINNEAPOLIS: The bracket goes through Louisville’s KFC Yum! Arena for the regional rounds on March 28 and March 30.